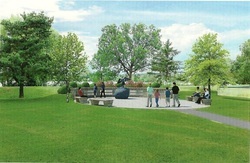 Plans to create a memorial park and erect an Angel of Hope statue on the Iron Range started in the fall of 2009. A group of bereaved parents shared a vision of a quiet place where families could go to remember their children and heal. With this vision in mind, the group decided to create a memorial park with the Angel of Hope as it’s centerpiece. 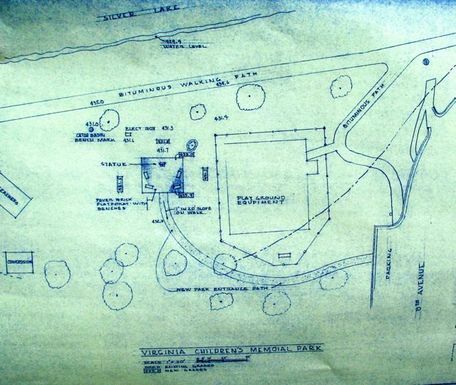 The City of Virginia graciously agreed to dedicate the land to create a Children’s Memorial Park. The Committee for the Children’s Memorial Park has successfully completed its fundraising and has purchased the Angel of Hope statue. Memorial walls with the names of children will continue to be added. These children will be remembered forever. We will continue to provide the trees and plaques to the families requesting one, and a walkway around the park with benches along the walkway. If you would like to make a donation to help build the park or wish to become involved in any way, please contact a committee member. The Park will be a regional park to provide a lasting tribute to all children who are gone from our sight but always in our hearts and a place of peace and beauty for all of our park visitors. The Angel of Hope Memorial Park will serve as a place where families can go to reflect, find comfort and peace after the loss of a child. The network of Angel of Hope Memorial Parks has been a significant blessing for many thousands of people since the first memorial was dedicated on December 6, 1994, in Salt Lake City, Utah. A common element of all of the Angel of Hope Memorial parks is a bronze angel with uplifted wings. The word "hope" is always inscribed on the angel's right wing. The park will have the Angel of Hope statue as the central figure, surrounded by memorials that will be inscribed to memorialize loved ones from the surrounding area.